Skincare is something I can happily spend hours and hours browsing for online or in a beauty department. Face masks are something I tend to find myself gravitating towards too, namely anything deep cleansing, blemish fighting yet still super nourishing. However sometimes when I fancy going for a seriously deep cleansing mask, I find I only need it in certain areas. The rest of my skin could do with a hydrating boost or a calming, nourishing mask. Enter 'multi-masking'. Yes that really is a term. Multi masking is the new skincare trend, whereby you mix and match you face masks to meet your skincare needs. I've found my skin reaping the benefits of multi masking. Often a really deep cleansing, anti-blemish mask can be really drying, especially on areas my skin doesn't really need it such as my cheeks and forehead. 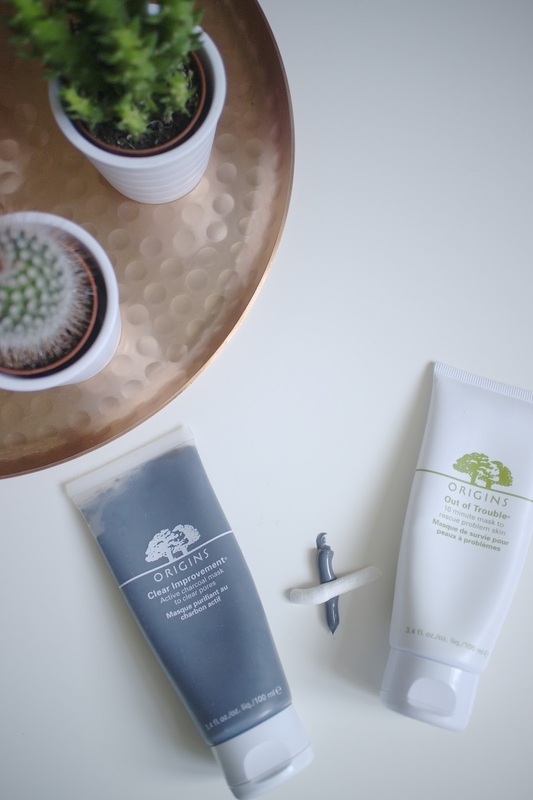 The combination that my skin is currently loving is a mix of the Origins Clear Improvement Active Charcoal Mask and also the Origins Out of Trouble 10 Minute Mask to Rescue Problem Skin. I usually apply this combination when my skin is having a freakout and breaking out left right and centre, and it's most often if I've had alcohol or slightly over-indulged in sugar. Just an FYI, my skin is mainly oily, blemish prone and hormonal - a bit of a nightmare, some might say. I have a lot of blackheads on my nose, so a deep, pore clearing mask such as the Clear Improvement Active Charcoal is always a necessity, mainly focussed on my T-Zone. Then I apply the Out of Trouble mask to any areas where I have blemishes, which is more often of not my chin/jaw line. The Out of Trouble mask is very, very thick and almost TCP-like in scent. A little goes a long way. The Clear Improvement mask isn't runny, but it's not as thick as typical charcoal/clay masks and is surprisingly nourishing. I leave this one for 10-15 minutes and then apply a warm damp flannel onto my skin for about 30 seconds to 'loosen' the product, before gently removing the product with the cloth. A quick splash of water to the face and a cooling facial mist such as the La Roche Posay Serozinc is a light way of refreshing the skin, before following up with serum/oil/moisturiser. I highly recommend multi masking the next time you choose to pamper your skin with a face mask, especially if you need a skincare boost. A hydrating mask mixed with a deep pore cleansing mask would be dreamy, or an exfoliating mask with a retexturing mask would also be a great combination. Have you tried multi masking yet? Are you a fan of pampering your skin with face masks? What are your current favourite task masks?